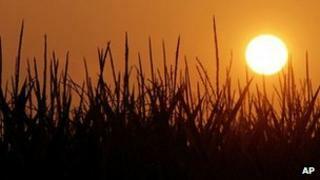 A team of British plant scientists has won a $10m (£6.4m) grant from the Gates Foundation to develop GM cereal crops. It is one of the largest single investments into GM in the UK and will be used to cultivate corn, wheat and rice that need little or no fertiliser. It comes at a time when bio-tech researchers are trying to allay public fears over genetic modification. The work at the John Innes Centre in Norwich is hoped to benefit African farmers who cannot afford fertiliser. Agricultural fertiliser is important for crop production across the globe. But the many of the poorest farmers cannot afford fertiliser - and it is responsible for large greenhouse gas emissions. The John Innes Centre is trying to engineer cereal crops that could get nitrogen from the air - as peas and beans do - rather than needing chemical ammonia spread on fields. If successful, it is hoped the project could revolutionise agriculture and, in particular, help struggling maize farmers in sub-Saharan Africa - something the Bill and Melinda Gates Foundation is keen to do. Professor Giles Oldroyd from the John Innes Centre, who is leading the team, said the project was vital for poorer producers and could have a "huge impact" on global agriculture. "We believe if we can get nitron fixing cereals we can deliver much higher yields to farmers in Africa and allow them to grow enough food for themselves." However, opponents of GM crops say results will not be achieved for decades at best, and global food shortages could be addressed now through improving distribution and cutting waste. Pete Riley, campaign director of the group GM Freeze, said there was a realisation by many farmers across the world that "GM is failing to deliver". "If you look in America, yields haven't increased by any significant amount and often go down," he said. He added: "Now we're seeing real, major problems for farmers in terms of weeds that are resistant to the herbicides which GM crops have been modified to tolerate."